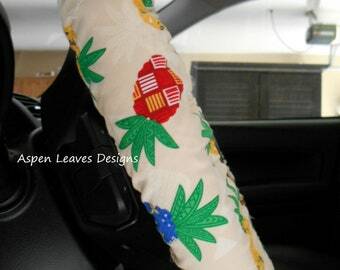 Tropical pineapple steering wheel cover. Fully lined summer style car accessory. Red, blue and yellow pineapple on cream fabric. Ships fast. Raspberry and white steering wheel cover. Fully lined floral car accessory. Pink and white floral with green leaves. Ships fast. Lips steering wheel cover. Fully lined. Mega girly car accessory. Lipstick, lips, make-up car decor. Ships fast. Red strawberry steering wheel cover. Fully lined. Red fruit on pink fabric. Summer car decor. Ships fast. Spring cherry steering wheel cover. Fully lined cherry car accessories. Small red cherries on cream fabric.Ships fast. Summer flip flop steering wheel cover. Fully lined summer style car accessory. Summer fun car accessory. Ships fast. Boho feather steering wheel cover. Fully lined colorful car accessory. Small, feather car accessory. Ships fast. Sunflower steering wheel cover. Fully lined. Wind blown sunflower blooms. Yellow on green floral car accessory. Ships fast. Fiesta green stripe steering wheel cover. Fully lined serape car decor. Red, blue, green car accessory. Ships fast. Boho floral steering wheel cover. Flowers on mint green fabric. Fully lined rose accessory. Watercolor floral. Ships fast.